Discussion in 'Birds' started by EdMac, May 22, 2005. I have a 24 ft above the ground pool in my yard. The cover is still on, and each year, around this time, we are visited by a pair of Mallards. Usually they only stay for an hour or so. This year it has been every morning and evening for the past several days. Here is a shot that I took this evening. In post procesing, I set the WB to daylight. This was taken after 7:00 PM EST. The light was fading fast. Comments welcome as always. How is the summer treating you. Nice to be there, I am sure. Your visitors are a delight. I see you are sooting the D100 almost all auto. Do you think that is a good working place. Let me know, I may try that. Thanks for the comments. We are having a cold wet spring, so far. Hopefully things will improve soon. I would sure like to get lazy at shooting. lolol All those settings all the time get to be a pain. I love to PP, only wish I was a bit better at it. Wishing you sun and warmth. 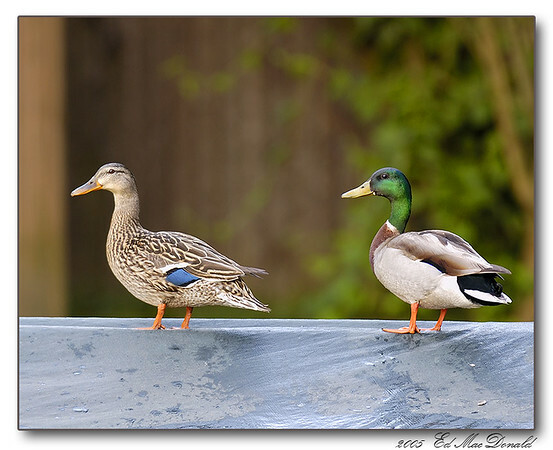 Beautiful picture of those mallards. Maybe they want to swim in the pool and are waiting for you to uncover it. I did not know you have a pool. It is very hot already here and my grandkids are enjoying swimming again. We are having a barbecue next Saturday. I hope that it gets warm enough to open the pool soon. It seems that we are stuck in the 60s around here. Thanks for your comments. We usually only get on visit by the Mallards. This year they like the pond effect of the water on the pool cover plus they have plenty of food. Maybe I will get some good shots, if the sun ever comes back out. Thanks for the comments. It is surprising what shows up in my back yard. Yeah, my back deck is becoming an observation platform. You never know what is going to visit the feeder. The weather is another story. We came home from the trailer early because of the rain and cool weather. I hope it gets better. Good luck at Bombay Hook.